On Jan. 17th in the second year of the Conference 22 Duals hosted by Liberty HS found the Falcons pushing their season record to 20 wins. A season that currently has Fauquier ranked 3rd in the state now has people wondering if this is the best team ever for the Falcons. No trophy would be needed for this six team dual event as the icon message here simply is for post season seeding purposes. A closer look at individual day’s records is all that is needed as six wrestlers went undefeated and the rest of the squad suffered only one defeat. For anyone who understands seeding this simply would lead the Falcon squad to be aligned with the number one and or the number two seeds. The Conference 22 post season tournament is set for Feb, 7th at Fauquier HS but we will have to wait till then to confirm any seeds. 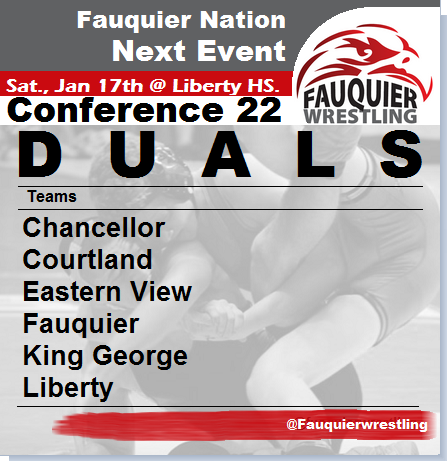 As team Fauquier shutout Courtland 76 - 0 and Chancellor 75 - 0 they then followed it up by romping Liberty 68-3 and King George 69-12 with at least 7 plus pins in each of these matches. Losing only 3 matches out of 56 bouts is clearly unheard of and another reason why this team is proving to be the best ever. The fifth and final round of the five rounds had Fauquier paired with Eastern View and a showdown in Southern Fauquier. Eastern View is currently ranked 19h in the state and does have a few ranked wrestlers as all eyes were on mat 2. With Fauquier resting there top wrestler senior Matt Raines and inserting Caleb Strum in at 138 pounds Eastern View still could not match the strength that team Fauquier possess. As Eastern View stole the first three matches and jumped out to a 9 to 0 lead the next 5 matches would put Fauquier ahead as they would shut the door on the Cyclones with a 48-21 win. Fauquier would once again earn 7 pins in this dual for a total of 37 pins on this Saturday. At day’s end top performers came from Kyle Budd, Ty Foster, Garrett Tingen, Clifford Harrison, and Andrew Smith who all went 5-0. Vito Camarca posted a 4-0 record as the rest of the squad all went 4-1for the day. Q: How gratifying is it to sweep the Conference 22 teams while earning two shutouts? Fisher - "I was really happy with the offensive production throughout the day. I have been preaching the need to establish our offense first and not wait, and most of us did that every match this week." Q: You had 37 pins at this event. Team has not earned that many in an event ever. Can you explain this? Fisher - "I think the guys derive confidence in our schedule and know that by this time of year, they are battle tested, have seen some of the best competition, and start believing in the work that they have put in." Q: With three weeks until the Conference 22 post season tournament is the team ready for a run for the state title? Fisher - "That would be a huge accomplishment, but we have more competition to go yet. We have a couple guys that are right on the cusp of where they need to be to make an impact at the state tournament. We will continue working hard and I am sure good things will happen." Next event: Fauquier will be traveling to Robinson HS. in Fairfax Virginia on Jan. 21st for a Double Dual. Then the team will head to Colonial Forge HS, Stafford VA on Jan. 24th Marine Corps Ultimate Challenge. Below will show more results of Fauquier Falcons by rounds. Match notes: Fauquier went 14-0 with 7 pins. Match notes: Fauquier went 13-1with 9 pins. 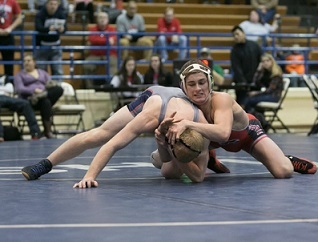 Match notes: Fauquier went 12-2 with 7 pins. Match notes: Fauquier went 9 - 5 with 7 pins.